Just two days away from Apple's annual press event where new iPhones are unveiled, more pictures have arrived featuring the 6.1-inch LCD model. 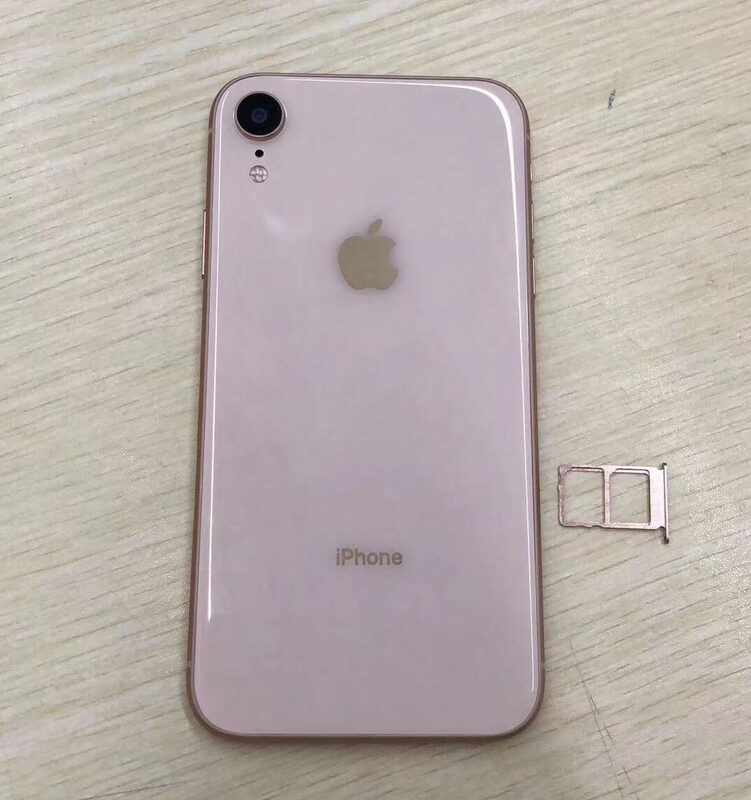 Believed to be called the iPhone XC, the new leak shows red, rose gold, and what appears to be blue, although some are claiming its still just space gray. 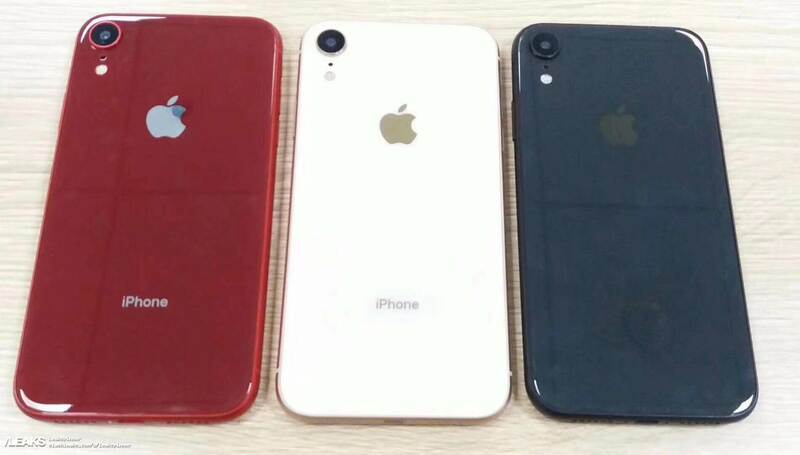 Instead of launching the Product(RED) edition iPhones half way through the product life cycle, Apple might be launching its red iPhone alongside all of the other models. Even though the special edition is still likely to carry a premium over other colors, it being released on time with other models makes it a much more compelling option. According to a Twitter user that has helped spread the leak, the pictured iPhones are prototype units, not mere clones or dummy units for designers to work with. Whether or not that means these devices can actually run iOS is unknown. Aside from the color options, we have learned that there will be dual-SIM support in certain regions. The SIM tray has been moved further down the side to a lower than expected location. Presumably, this was to be able to fit the extended length tray. Matching up with previous leaks, the iPhone XC features a single rear camera with LED flash. The phone body pictured is made from an aluminum frame with glass backing to keep support for wireless charging. 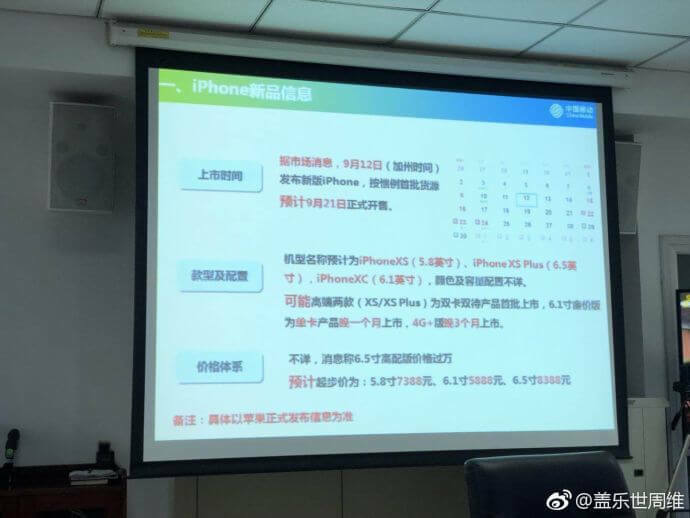 A leaked slide from a China Mobile presentation shows that the three models of iPhones will be called the iPhone XS, iPhone XC, and iPhone XS Plus. This goes against previous rumors that the largest iPhone would carry the "Max" moniker instead of plus, so take that as you will. The slide also shows that preorders for the iPhone are likely to go live on Friday, September 14th. Shipments and in-store pickup are expected to be available on September 21st. Pricing in China is set at 5,888 yuan, 7,388 yuan, and 8,388 yuan respectively for the varying sizes. These do not equate to perfectly even prices in USD, but are a few dollars more than $849, $1,049, and $1,199.